Image caption David Davis has reportedly said the EU's actions should not go "unchallenged"
The EU has defended its right to make plans for a "no-deal" Brexit, amid UK fears firms may lose out as a result. David Davis has reportedly complained about EU guidance stating the UK would become a "third country" in 2019 with no reference to a possible trade deal. In a letter to Theresa May, obtained by the FT, the Brexit secretary warned UK firms may have to relocate to Europe or risk seeing contracts terminated. But the EU said the UK had first raised the possibility of there being no deal. A spokeswoman rejected suggestions that Britain was being treated differently to other EU members and that its rights were being abused. The second phase of Brexit negotiations, covering transitional arrangements after the UK leaves and economic and security co-operation in the future, are due to begin soon. Prime Minister Theresa May has said it is right to plan for all scenarios, including no deal, but she is confident the two sides will reach an agreement on their post-Brexit relations in time for the UK's departure. But British concerns about the EU's own preparations for Brexit have surfaced with Mr Davis suggesting they are "frequently damaging to UK interests". In a letter to Mrs May last month, extracts of which have been seen by the Financial Times, he warned it was potentially discriminatory of EU agencies to have issued guidance to businesses stating that the UK would become a "third country" outside the EU without any reference to a future trade deal sought by both sides. 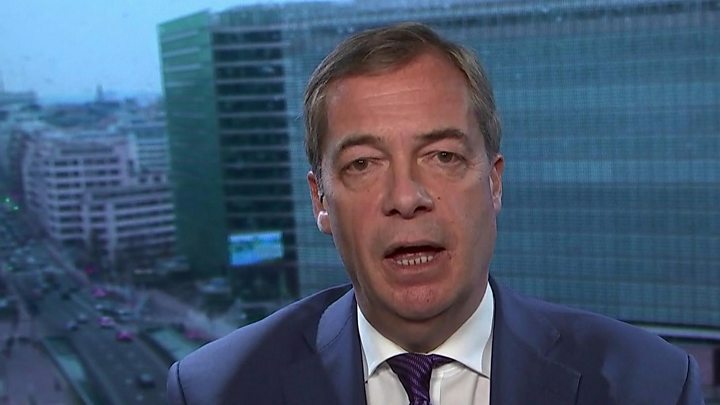 Media captionNigel Farage says no deal "would hurt Europe far more than it would hurt us". Warning the EU's current stance amounted to "potential breaches of the UK's rights as a member state", he said he would urge the European Commission's Brexit taskforce to withdraw the statements made so far, in light of the agreement reached in December to begin trade negotiations. 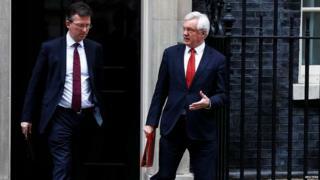 A Number 10 spokesman said it did not comment on leaks, but the EU insisted its contingency planning was not a breach of the UK's rights as a full member until the date of its departure. "We are surprised that the UK is surprised that we are preparing for a scenario announced by the UK government itself," the commission's chief spokeswoman said. "After all, it was Theresa May herself who said in her Lancaster House speech in January 2017, and repeated in her Florence speech in September, that 'no deal for Britain is better than a bad deal for Britain, it is right that the government should prepare for every eventuality'. "So we take these words by the prime minister very seriously, and it is therefore only natural that in this house we also prepare for every eventuality." Scottish First Minister Nicola Sturgeon, who favours the UK remaining in the single market and customs union, said Mr Davis's words were "extraordinary" given the government had set aside £3.7bn to prepare the UK for the possibility of leaving without an agreement. And Labour MP Pat McFadden, who supports the Open Britain campaign for close ties with the EU, said the EU's actions should "come as no surprise" as the UK was "implicitly threatening a no-deal scenario" itself. Meanwhile, the SNP, Liberal Democrats, Green Party and Plaid Cymru accused Labour of an "abdication of responsibility" for declining to join them in backing single market membership after Brexit. Following a cross-party meeting in Parliament, they criticised Jeremy Corbyn's pursuit of a "jobs-first" Brexit, arguing it was impossible without backing single market membership, as some Labour MPs are urging. In response, Labour sources said the single market was "not a membership club that can be joined" and the party's goal was to retain the benefits of the single market through the negotiation.